In the late 1950s, a young John Morton was transfixed with sports car racing. His dreams of competition eventually led him to enroll, in 1962, in the Shelby School of High Performance Driving. In a bold moment after the last class, Morton asked Carroll Shelby if he might come to work for the newly formed Shelby American. The answer was “Yes, here's a broom.” Thus ended Morton's college career and began his long racing career. Over the next three years, Morton would be a firsthand witness to the evolution of one of the most iconic sports car builders and racing teams of the 1960s. 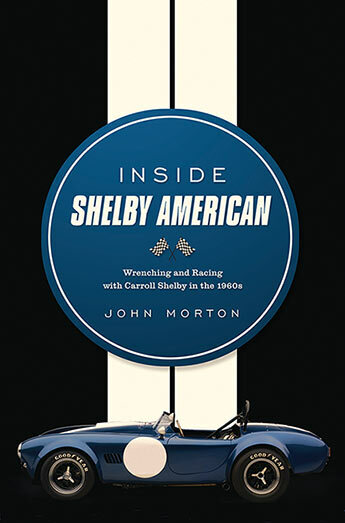 Inside Shelby American is his personal account of a company overflowing with talent, from designer Pete Brock to fabricator extraordinare Phil Remington to drivers like Dan Gurney, Ken Miles, Bob Bondurant, and Phil Hill. The cars were equally captivating: AC Cobra, Mustang GT350, Ford GT, Daytona Coupe. In this book, Morton’s story is intertwined with the memories of other Shelby staffers of the period, revealing through historic photography and an untold perspective the rousing story of America’s most legendary racer and car builder. John Morton moved to California from Illinois in 1962 to enroll in Carroll Shelby's driving school at Riverside. After completion, with Peter Brock having been his instructor, John asked Shelby for a job on the racing team. He progressed from shop janitor to team driver in 1964, launching a career that spanned over forty years and joining the Shelby team at the most successful period in its history. In the early 1970s, John drove for Brock's BRE Datsun team, winning two National Championships and two 2.5 Trans-Am Championships. Career highlights include nine drives with two class wins at Le Mans and two GTP victories at Riverside, including the last sports car race at the facility in 1987 in a Group 44 Jaguar. Morton resides in El Segundo, CA.